Can You Really Make Money As An Amazon Affiliate or is it Not Worth Your Time? Summary: You can definitely make good money promoting Amazon products however you need training, tools and support to make it work. Amazon is currently the most popular e-commerce site in the entire world, and with that they’ve obviously established an extremely reputable brand. Their associate (affiliate) program is widely used by affiliate marketers and can convert quite well if you know how to market properly. As long as you live within an approved state or country (residents of Arkansas, Colorado, Maine, Minnesota, Missouri, and Rhode Island are not allowed to participate) they aren’t very picky about accepting people into the program. Beware of SCAMS from people claiming to work with Amazon! NOTE: If you found this page because you’ve been contacted by a sales rep to become an Amazon Associate for a fee (ranging from $100 – $1,000’s) then read this post here. Those people are scam artists and do NOT work for Amazon. My review here is in reference to the real program and has no association to those types of scams. The first thing you need to make sure you do before you try joining Amazon’s program is to have a relevant website. Amazon requires a website for their application process. My recommended training will get you set up with a website if you don’t already have one. However, if you find yourself denied to the program make sure you are adhering to their terms and conditions. Usually it’s either because you’re violating their agreement (Amazon doesn’t approve websites with sexually explicit material, violence, discrimination, or ones that promote illegal activities) or because your site isn’t developed enough. When first starting out in affiliate marketing, many people get anxious and start applying for affiliate programs left and right, before they even have a solid foundation for promoting the material. You can always wait and reapply after you’ve tweaked or added more content to your site. They welcome applicants to reapply at any time, so not getting in on the first attempt isn’t the end of the world. But once you’re accepted, is it realistic to expect to make money as an Amazon Affiliate? You can definitely make money using Amazon’s program, but the amount of income you make is going to be highly variable. There are right and wrong ways to market online; posting Amazon’s affiliate links around your website and social media isn’t going to be enough to make money. Sure, you may get lucky and get the odd sale here and there – but if you’re not providing value to your readers, there’s no reason for people to buy from your link. Another huge chunk of the equation is the types of products you are selling from Amazon. Their commission rates are generally lower than average, so if you’re promoting a $5.00 product at 4% base commission, that’s only 20 cents per sale! You’d have to make a lot of sales to even earn anything worth while, and it probably isn’t worth it. The key is to promote higher priced items – ones that earn you at least $4 or $5 a sale, but preferrably above $15. Keep in mind the more you can make per sale, the less sales you have to make to earn money; which ultimately comes down to less work for you. Amazon isn’t a “way” to make money online, but it’s a tool you can leverage to help you out with the battle. The program only will “work” for you if you put in the effort to make it work. It takes proper training and guidance to get started no matter what affiliate program you’re using. But let’s talk a bit more in detail about Amazon…. I’ve used many affiliate programs as an online marketer, and at least in my experience, Amazon’s program has a relatively high conversion rate compared to other affiliate programs. Many people prefer not to use the Amazon Associates program largely because the commissions are pretty small compared to some other programs. And that is very true, as it is not unheard of for other affiliate programs to offer up to 75% commissions. Let’s face it – compared to the 4-8% rate for Amazon, it sure seems a lot better. But keep in mind your conversion rate is an extremely important aspect to your affiliate campaigns. And yes, your personal campaign will have a high impact on your conversion rate, but did you know the actual program you’re promoting also has a huge impact as well? If you’re promoting through a little known sales outlet people are going to be less likely to actually buy, and not many companies have a conversion funnel as powerful as Amazon’s. However, average commission rate largely depends upon your niche and what you’re promoting – so for many niches, 4-8% is about average. It really comes down to what you’re selling , so keep in mind that the Amazon program really isn’t the best option for every niche. 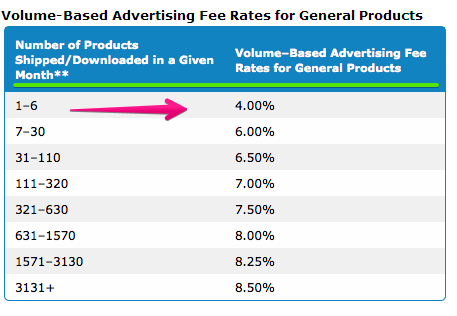 Amazon has two different commission structures for their affiliate program – volume based rates and fixed rates. For certain product categories (as you can refer to the table bel0w) the commission rate you receive will remain constant, whereas for their general products your commission rate can increase up to 8.5%, depending on how much you sell. It’s important to note the rate for volume based product commission resets at the beginning of each month. Say you’re promoting something somewhat expensive, say around $400-$500 (like an iphone or tablet). 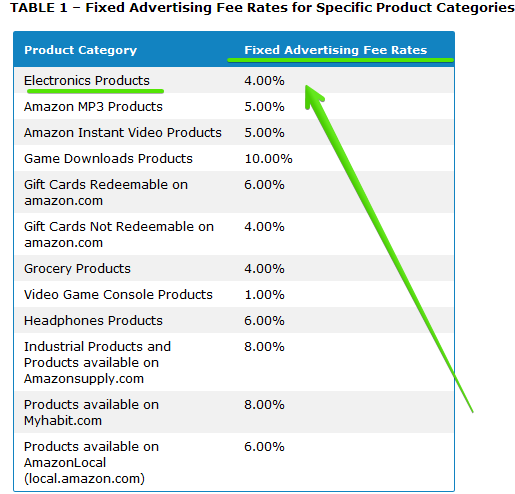 Amazon has a fixed commission rate of 4% for electronics. Obviously if you’re promoting things that aren’t so expensive you’d have to sell many more to add up, but that doesn’t mean it isn’t possible. Let’s face it, who hasn’t heard of Amazon? They’re the #1 E-commerce site in the world – millions of people buy from them every single day. This is good news because it means there’s already an existing trust factor between your customer and the brand. Most likely your audience has purchased something from Amazon.com in the past, so they would be less hesitant to buy from them again and you’re more likely to make a sale. What can’t you buy on Amazon? There are many, MANY niches that are relevant to products sold on Amazon. They’ll provide you with everything you need to know – lots of pictures, product information, customer reviews. They even show you related products and accessories that you may not have thought about, but would be more likely to consider buying now that it’s displayed in front of you! People find product reviews very helpful and they definitely increase sales (assuming they’re positive). In 2013, around 30% of my Amazon sales were from products entirely unrelated to my niche. This means that if you can catch people in a buying mood, they’re likely to be tempted to buy something from Amazon just from clicking around the site. Like I said, GREAT SALES FUNNEL! And it’s a perfectly legitimate question, why would they? You need to give your visitors a reason to buy it from your link. It’s unrealistic to expect people to click and buy from your link just because it exists. This means aiming for keywords that people are typing when they are already looking for information or reviews on a particular item. Take a look at this article about the customer purchase life-cycle, it will provide you with a clearer idea. 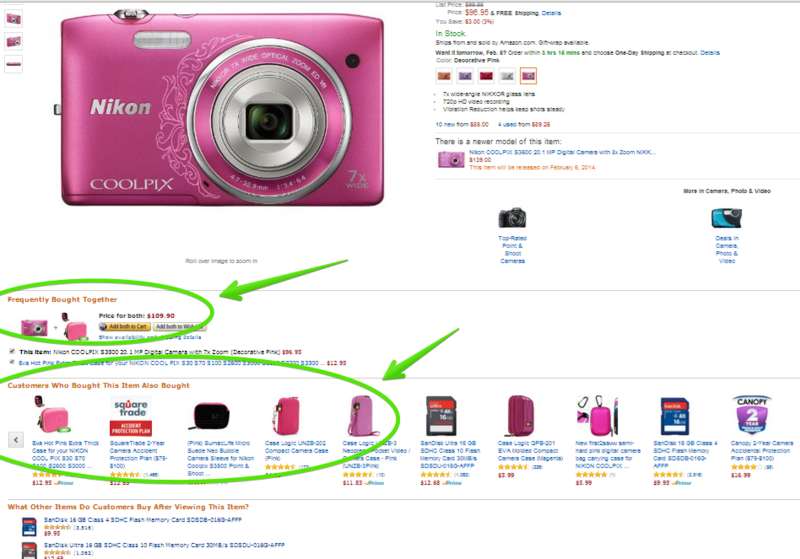 Don’t just link a product or provide links to lots of products (like using an Amazon shopping store via your website). They won’t convert well. Remember you need to give your visitors a reason to want to buy from you. Write a review of whatever it is you are selling, but don’t just rehash the same reviews that already exist on Amazon’s website. Make it personal, interesting and most importantly helpful! I find that a text link within the review has a much higher click through rate than just a big banner ad for a couple of reasons. Firstly, people tend to ignore anything that looks like an ad online because they are so used to seeing them they’ve just learned to tune them out. Secondly, many people have ad block software installed in their internet browsers and if you only provide an affiliate ad with no text they won’t be able to see it! Last, your readers that actually read your content are more likely to trust you. You know what they say, an image is worth a thousand words. This is especially true when you’re trying to get someone to buy something. Amazon provides images of nearly everything they sell, so you can always use the ones they provide you. I find Amazon to be an excellent affiliate program despite the lower commission rates, and for me has proven to be a very high converting one at that. If you were questioning if you could really make any money being an Amazon Associate, I can assure you it’s entirely possible if you’re smart about it. Remember, your effectiveness with online marketing all comes down to providing value to your customers! Be information, provide value and earn your readers trust. Don’t just sloppily post your Amazon links all over your site with no valuable or unique content; your readers won’t have any reason to buy from you versus going directly to Amazon, or another affiliate’s site that is perhaps more helpful than yours. Because of their lower commission rate, you do have to sell a lot more product than with some other programs to make decent money, but it can still be done. Get started with my training recommendation if you are really interested in making money with Amazon! This is just coming from what I’ve experienced with the program, so what’s your take on the Amazon Associates program? I’d love to hear other people’s personal experiences! This article is pretty old now. I have been thinking about starting a blog and applying to the program. Do you feel the same about being an Amazon Associate now as you did about it then? I do still recommend the program, even though they’ve made some changes. There are many, many affiliate programs out there though, so I wouldn’t necessarily limit yourself to Amazon exclusively. You can use multiple affiliate programs on the same website. The thing I like about Amazon is it converts well. Also, many people will buy a lot of stuff on Amazon when they make an order, and you get commissions for anything that was purchased, not just the product(s) you were linking them to. Hi, Wendy, I just signed up for the Amazon Affiliate program, but I don’t have a blog site. I am planning on putting links in my Facebook personal blog pages. Will that work? Right now, I am spending much time thinking and doing a post for my page. And so I can only post once a week. But I spending half day researching and reading on a topic to find what is best to post.. Am I doing it right? I am yet building followers so I am not putting Amazon links there yet. Hey Jen, I’d strongly recommend getting your own website if you want to work with the Amazon program. Are you referring to posting twice per week on your Facebook? You really want to work on creating that content for your own website, then you can use Facebook to link to the posts. You can also use a variety of other sources to gain a following like other social media (instagram and pinterest can be excellent tools for certain niches) or video marketing. But no matter how you work to gain your following, I’d recommend having your own blog to link back to. Great post! I am an Amazon Associate and have finally produced a few sales. I am in the dog food niche and am currently promoting a number of Amazon products with my own blog. In my opinion, offering my readers ‘value’ is the main reason behind a few of my sales. My readers have slowly gained a sense of ‘trust’ with me that is now paying dividends. Thanks Wendy, I will continue to look for further information throughout your articles. Hello wendy, is there any minimum product to be sold as an amazon affiliate ? I believe you have to make at least 1 sale within 90 days of becoming accepted into the affiliate program, so it is not unreasonable. If you end up not making a sale within those 90 days you are allowed to re-apply to the program. After many years in the Amazon Associates program, I really appreciate your review and tips. I joined the program to put offers on pages in my old B2B website ( banthrax.com ) in hopes of attracting more prospects and getting some income from ones that didn’t buy my proprietary products. I’ve learned enough lately to have some clues about where I missed the mark, but your post really helped me see how to leverage Amazon’s power and make a dollar or two. More importantly, you’ve given me confidence in this program that delivered nothing for years, because I used it poorly. Hey Wendy, i would really like to know what is a realistic income expectation for some one who is starting as an affiliate. I know you have to take into account a lot of factors in order to answer this question, but an accurate average could really help. Thanks for the information, i really love your posts! Well it really varies so much because it depends on the individual and what they put into it, as well as what they want to achieve. Just starting out, it may take 6 months to a year to make an extra 1,000 – 2,000 per month in some cases. But those numbers could be higher or lower than what you make, it is impossible to say. I will just say that is is completely realistic to make that much by the 6 month – 1 year mark, if not more. And after that, it’s just about scaling up. i just received a call from a gentleman from the Alpha Marketing Group that is going to create a website and then link to Amazon as an affiliate for $214. Is this a SCAM.? I am not familiar with this company so I can’t say for sure, but what I can tell you is many of these companies that call you and want to create an amazon affiliate site for you aren’t worth it. Having a site set up to be an Amazon Affiliate is one thing, but that alone won’t make you any money. Links to Amazon are worthless if you have no idea who your audience is and how to help them. Where is your traffic coming from? Who are you trying to help? You need to create a focused niche and provide valuable content, and work on ways to drive traffic. Otherwise you have an overpriced website that won’t make you a dime! I want to start Amazon business but i do not good SEO . But how can i start amazon business some one please share me your comments also how to share amazon product link Twitter and Facebook . I recommend you check out my #1 recommended training program here on my site for learning SEO and building an online business. I have just started with Amazon Affiliate and I am having a really hard time trying to make some sales. I am very glad that you did this article because I really did learn a great deal about the program. Not really sure how to fully promote my links. I have been posting to Twitter and FaceBook. It is really a shame that some people are using the Amazon name to scam people out of their money. Are you trying to promote a website or just Amazon Affiliate links? You definitely want to promote content on a website (that will have your affiliate link) over just an affilate link on its own. Facebook and Twitter aren’t necessarily the best way to promote an Amazon Affiliate type website, but of course it all depends. I’d recommend trying to build out a website with content that ranks in search engines, and gain traffic through that method. You can also use paid ad campaigns in search engines to promote your stuff as well. I just saw your reply and thank you for replying. I have a blog that has been in existence for about six months and it is called sashamoniquetalksadviceshow.blogspot.com and I have my Amazon links on that blog. I have a more established blog called sashamoniquetalks.blogspot.com and it has been around since August 2014. I have Adsense on the older blog and I was scared to put Amazon on my more established blog because I didn’t want it to interfere with my Adsense. I started Amazon Affiliates in October 2016 and have not seen not one sell and I am very frustrated right now. I am trying very hard to promote my links on my social media pages. Adsense and affiliate links (like from Amazon) can still work together on the same blog but the only way to know for sure is to experiment. As far as why you’re not making sales with your Amazon links there could be a lot of reasons. I am not sure what the focal point of your blog is – do you have a niche of sorts? Do you have traffic coming in, and if so, where is it coming from? Do you have targeted product reviews? 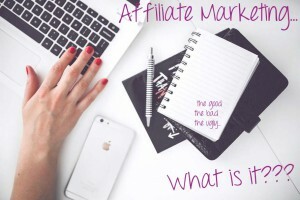 Affiliate marketing is a lot more than just having affiliate links included in your blog, you have to understand targeted traffic and how to promote what you are trying to sell. I suggest you check out my recommended training program here. It can help you tremendously. Great Article! I have a quick question thats been bugging me. If I live in Australia is it possible for me to use the Amazon affiliate of the US to make money? Yes there are ways to do that. For example, if you have a WP site you can install a plugin (there are different ones available) that will convert the links to the country in which the person clicking is located, so you will get the commission for those outside of Australia (like the US for example). I had a web hosting company that left me in the cold. They Pretended that the site they developed had been approved and linked to Amazon. Further development revealed, that was not true. Now, the company will not respond to my phone calls. I have a website……can you help me get it approved, so I can sell Amazon products? I have approximately 180 days to make a sale. I recommend you check out my training suggestion here (or sign up for my email course) it will help you learn more about the process and get on the right foot! This is great what you doing!I have a question for you if you can tell me: What do you know about tax form? Should i put myself like a individual and put my ssn or i need to have register a company? Cuz i got approved from amazon for the affiliate just not sure what to do with that form. To start you can just put yourself as an individual and use your SSN – you do not need to register as a business. When you start earning more money you might want to think about creating a business but there is no need in the beginning if you don’t want to. I am thinking to use it, the comments helps me too much, thank you. By the way i want to say that the college helps to learn to think and solves problems that we will need it for all our life. What are the procedures you must utilize to make sure your URL has been properly introduced to Amazon Inc. in order to be paid for the products sold as an affiliate? All you need to do is apply for the Amazon Associates program, you’ll need a website to put down on the application, but once accepted you are free to use the links on any website you want. You can create special tracking IDs to use on different websites to know where the sales are coming from. You don’t really need to register each URL with Amazon though in order to get paid. I have also been contacted by someone saying they are with Amazon Associates. They set me up with a free website and would charge $20 month to host it. But they are wanting me to invest money to pay Google to direct traffic to my website have you ever heard of this before? It sounds like a scam to me. Amazon Associates never will directly contact and solicit to people like that. Thanks so much for your insight & information on this scam. Now I know for SURE the people contacting me are just a scam. As always, something that sounds too good to be true usually is. I was contacted today by Amazon Associates saying I was selected because I’m a prime member and buy a lot from them. I, too, was told that it would be $19.95 a month (if I make commissions) to host my domain name. How do I know if it is a scam or not? I say it is probably a scam because Amazon Associates does not call people like that, they are probably a independent company claiming to be part of Amazon Associates. I would be careful. You can host your website at any well known or legit hosting company and sign up for the Amazon Associates program for free. I recommend you check out this training if you are interested in learning more about affiliate marketing. So, does this mean that if someone buys a high ticket item after clicking through to Amazon from my site, and the merchandise gets lost in the mail they’re going to come after me for what could be hundreds or thousands of dollars worth or merchandise? Isn’t Amazon responsible for this fulfillment and tracking a product if it was never received or was damaged in shipping? I am pretty sure the “risk of loss” is located within the general user terms of service agreement, not for affiliates. You will never be charged for anything like that! Worst case a customer gets a refund and you lose the commission, but as far as going after you for 1,000’s in merchandise, no that will never happen. This is why there is a 90 day period after sales are made before they give you the commissions, to account for returns/refunds. It is a long waiting period but once you start making sales, after the first 3 months you should get checks every month consistently, they will just always be 3 months behind. I’ll be signing up for WA today! And of course I’ll click through from your link on this page. I’m 99% sure I’ll be signing up for the premium service after my free trial is up. No problem, Marcus. I appreciate that a lot, and also look forward to working with you! I was contacted by an “Amazon Rep” who explained that it is a great home business and earning potential was very good. They would set me up with a free website and training. It was free, BUT there is a $399.00 sign up fee! I was hesitant and glad I read this article. There are so many “home business” scams! Yeah those Amazon scams are everywhere! You really have to be careful, I have heard so many horror stories. People hear Amazon and think it’s legit, but these people are not associated with Amazon at all. I have a niche website and make about $100 per month with Amazon affiliate program and get about 3,000 visitors per month. I just implemented the CPM ads, but normally I use the Native Ads in Custom mode to link specific products to my articles. I also use text links in the content, optimize my images for keywords and also use an affiliate link in the image. I notice that a lot of my traffic comes from Google images so people should always optimize images. My biggest challenge is just keeping up with writing articles. It’s easy to get burned out. Yet, because I’ve continued to write monthly I have seen my income grow from $321 in year one to more than double that in the first 5 months of 2016. Is it worth the time? I think so. One, because I can eventually flip my site, and Two – if I keep the site, it’s an additional $1000 or more of income per year with potential to be a whole lot more. For people who want to get into blogging for money – or promoting Amazon products on their site – they should remember that it takes time and commitment to make it work. Thanks for sharing here Carlin, you’re right! It does take a lot of time and effort. Even if you aren’t making a lot you have to think of the passive income potential these kinds of sites can have. I was just thinking earlier how ONE article I have that promotes an Amazon product makes about 100 per month alone. $100 from ONE article, every month. It has been up for 3 years.. that is $3,600 so far (and counting)! I want to start online selling for Amazon but I know you have to first have a website, which I don’t have because I haven’t started this is a new idea for me. I’ve bought courses but they don’t seem to give advice on the very beginning. For example if I have nothing to sell, yet, because im not affiliated yet, what would my website content be about? For this reason I thought about starting a diy home decor blog first, then linking in items used on projects but then it wouldn’t be a single niche, it would turn into a full on blog. What do you think is best for first timer? You would start by picking a niche and then go from there. DIY home decor is technically a niche but it is relatively broad. Even though you could make it work, my advice for a first timer would be to try to focus on as specific an audience as possible. So you could turn it into “DIY Bathroom Decor” or “DIY Nursery Decor” or even “DIY Wood Working Home Decor” each one of those would be a very specific branch of it. You could create a domain name that is generalized/brandable so you can start with a particular topic, then the further you go you can branch out and incorporate more and more categories so it is a wider home decor blog. You should try starting with the free training provided here, it will help you get a better idea on how to start! I tried Amazon affiliate. After getting 9 sales in one day, they denied me and I never got paid. Most likely you can fix it and reapply to the program. Hi Wendy I love your advice! I am an Amazon Affiliate/ Momprenuer since about January..I have not made anything yet and haven’t given up on my site for Single Moms latoniacares.blogspot.com and all of my effort in marketing products left and right….I just need to know if people are just not buying right now…or is it about relationships or what…please help!!! Thank you!!! No registration is required to comment here, anybody can! Hi, Wendy. Thanks for your input, I found it quite a good way to look at it. Do you know the best way to receive payment? 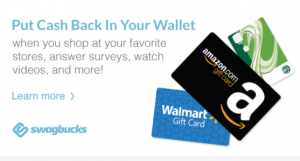 Does an Amazon gift card get you more reward than say a cheque or direct deposit? Just wondering if there’s any difference. Hi Chris, no I’m pretty sure it’d be the same amount whether you want it by check, direct deposit or a gift card. I always get direct deposits and that’s what works best for me. Actually, there’s a $15 processing fee if you request a mailed check, so that is the worst way to go. They didn’t tell me anything about a check processing fee. Could it be that things have changed between February and now (August)? I really hope I didn’t make a big mistake. Are you talking about for the Amazon Associates program? There shouldn’t be any type of monthly fee for website management if you are an affiliate for Amazon, it is entirely free. Also the check processing fee is only you get a mailed check instead of direct deposit. There are a lot of scams going around and it misleads and confuses people about what Amazon Associates really is. Hi Wendy I have signed up to the Amazon ssociates, im just finishing of my web page so that I have enough information on there to be accepted. Is it right that I have a direct debit from my account each month for this domain? I’m not sure what you mean Marianne. Where did you buy the hosting and domain from? I am an Indian author and have so far published seven books. The books are available as ebooks through Amazon kdp ; hard copies through amazon createspace and also through my traditional publisher who is selling my books through Amazon. I recently joined Amazon associate program and wish to know if I can sell my own books through this program. Since the cost of these books is less than $10, will it be worth to sell them through this program. Hmm, well I found this help page that may help answer you questions – https://authorcentral.amazon.com/gp/help?ie=UTF8&topicID=200650270 I’m not personally familiar with it because I’ve never used Amazon to sell my own books before. I am an Indian author and have so far published seven books. The books are available as ebooks (Amazon KDP), hard copies (Amazon createspace) and also through my traditional publisher which is being sold by Amazon. I have recently joined the Amazon Associate program. Kindly let me know if I can sell my own books through this program and if so what is the procedure for the same. Since the cost of these books is less than $10, will it be worth selling them through this program. Hi Wendy, I just created a true crime and criminology related Amazon affiliate bookstore website (beezbooks.com). I used to sell laptops and similar items on ebay, so I know it’s the $200 or more items that make money. Books can be bought anywhere, I know. Do I stand a chance with this particular niche? Or should I switch to selling higher priced items? I was contacted last night and was asked for the $200 start up fee I figured that it might be a scam and that is what lead me to this site. I may check out your email course. I am currently a buyer and know the ropes but this is somewhat different and I do not get commission on anything I sell. Thanks for the info. Yeah definitely check it out 🙂 No problem. Hi Wendy … I assume you are an Amazon Affiliate. Have you been happy with the results? I’m giving some thought to converting a niche site to an Amazon site, but I here there are some potential headaches to deal with in the program. I’ve got a niche site and haven’t been satisfied with monetization results to date. Traffic to my site dropped significantly in the month of December, and is now back up where it was in November. I assume this is the “Amazon Effect” since the products that line up with my niche are easily available on Amazon. I think it’s so cool you are going to the WA – SAC. Congratulations. There are a number of reasons for fluctuating traffic, I can’t say for sure what caused it. Yeah, I am happy with the Amazon program overall but the commissions are relatively low, so if you promote products on Amazon it really is best if they are a higher ticket item, over $100. It is incredibly hard to make money on Amazon if you are only promoting very low cost products. Just my 2 cents. Thank you! It’s coming up soon! I have just been contacted by someone who works for Amazon explaining the Amazon Associate Program and they talked me out of $500 to develop my Website which they have done but now they want $9,000 to get me going so I can make money. I am very nervous about letting go of this amount of money when I am 73 years old and have already been scammed twice (on unrelated issues) and am technically challenged. Please advise. Thanks. Linda, DON’T give them your money!!!! It makes me sick that there are so many bad people out there. Wow, I am so sorry that happened to you. I can’t believe there are people out there that are willing to take advantage of people like that just to make a buck, it is incredibly sick. I was contacted by an amazon associate program called “magers discounts” and am skeptical because they’re asking for a $300 investment towards their program which would give me my own website, domain name, one on one support, and all the tools necessary to succeed. Have you heard of magers discounts? I don’t know if this is a scam or not. What are your thoughts on this? I want to create my own health blog (niche) and write articles/reviews and recommend products I personally use using the associates program. Thanks for your time! The Amazon Associates program is entirely free to join in and of itself, so I’m not sure as I haven’t heard specifically of what you’re referring to. I would be hesitant to join any company that personally contacts you like that. What I can tell you is there are A LOT of scams involving people claiming to be associated with Amazon and trying to sell them websites, so it seems at best a little shady. I read your post Can You Really Make Money As An Amazon Affiliate or is it Not Worth Your Time? with interest. My nephew is web development. Now he plans to Launch his own affiliate program with Amazon. During my research I found about a person who had quite a few websites about products. Say for instance one site reviews snow blowers. Another electric tooth brushes. Still another pressure cookers. The strange thing is that there are only four reviews on each website he has launched and they have been left alone and no updates have been made. we were wondering will he make money with the affiliate program? We believe that we will have to first make a review website and then request Amazon to make us an affiliate or is it vice versa. Secondly as the winters and Holidays season is fast approaching we have some difficulty in selecting the products for our affiliate website. Should we choose electronic items, kichenware, toys, gifts or what? Can you please advice us in this regards. You first have to create the website and then apply for the Amazon Associates program. Once you’re accepted, you can create a new ID to use on any additional websites you create and there’s no need to reapply for each site you want to affiliate with Amazon. Most likely websites with only a small handful of product reviews won’t be successful. It takes a lot of unique and helpful content creation and generally a few months of consistent posting to even be able to start ranking in search engines like Google. Sure, you can always use paid advertising for your site or find other means of gaining traffic, but that can get really expensive. And the thing is, people like to buy from someone they trust. If your site only has a couple reviews and no other content, it isn’t very well developed and most people will click away before they go on to try and buy something. As for what to promote, I would suggest finding a niche you are actually interested in. Electronic items, toys and gifts are incredibly vague – you have to narrow down to a particular type or certain audience. I would suggest checking this program out if you want to learn more. I just signed up for amazon affiliate with a gentleman named josh for $200. Did I make a mistake? Yes, I would ask for your money back. There is nobody that works for the Amazon affiliate program and signs people up to become affiliates, that is an entirely free program by Amazon that anyone can apply for. This “Josh” fellow is a 3rd party scam artist that does NOT work for Amazon! My problem with the amazon program is there are many, many rules in place to take the sale and not give you a dime in commission. Like the person must be a stranger rule. according to amazon if you know the person in any way you don’t get the commission. this may be that I just chatted with the person. Or a person who is your friend On facebook. And yes this is direct from a call I made to amazon because I didn’t get my .40 cent commission. Also according to amazon You can’t post on facebook groups you don’t own. Basically that’s all of them. The rules go on and on. But of cause they don’t mind taking the sale. They won’t tell you how they claim to know. They say they can’t list their criteria, but I have several sales over the past few months for which (again for reasons they won’t disclose) they are not paying me for. It’s most likely a scam from the sounds of it… what are they offering you for the 99 per month? You have done a very important step in your online success: due diligence. Seeking further information on a program before joining it. Every day thousands of people seeking to begin their online “Profitable” business or money making program join a program without looking at what others have to say about it before joining the program, only to learn that they have been taken. They pay, the program is a scam, and they can’t get their money back. Yep, it has happened to me, not once, but a few times. It takes time to learn a lesson specially when fantasy is in our emotions and minds: overnight riches. First: how did “Amazon?” get your phone number? I have been associated with Amazons for several years, and have never received a phone call from them: not as an associate, not as a customer. All my communications with Amazon have been through email. Wealthy Affiliates is an excellent program to join, you can stay free forever, but the best option is Premium, but that is your decision. I have been with them for almost two years. Amazon associates (affiliates) is free to join, but there are outside providers that offer you good options to optimize their sales funnel. Never join a program until you do some research on it. And, of course, never give your credit card info even if it is for $1.95. You never know what they will do with your CC info. And beware of recurring billings. I have recently signed up for Affiliate Program for Amazon through an advertisement I saw on a website. The website that I was directed to for the sign up did not look legitimate, but I signed up anyway as it only required my email address and phone number. Straight after I received an email thanking me for my interest and so on. The very next day I received a phone call from from Affiliate and they told me that I need to pay a small fee of $1.95 to sign up to start the free 5 day trial to see if I was satisfied, and then continue to pay a fee of $29.90 (or some other price around this price range) to continue. I have done a small amount of research to see if this program is legitimate and I was directed to your page. I have read on another website that it is free to work with affiliate and if they ask me to pay a fee, then it is a scam. I have not given them my credit card details to make the first payment. I am honestly not sure if what I have signed up for is a legitimate way to sign up with Affiliate and I need your help. I would like to know your opinion on whether you think I should continue to believe that what I have signed up for is legitimate and go ahead with the payments, or if I should discontinue as I will be scammed from my money. 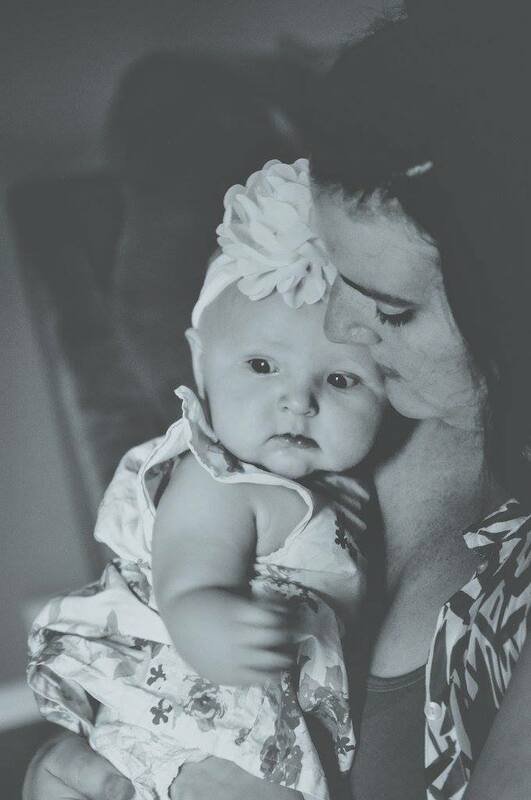 Please help me with my situation as I desperately require someone’s assistance. What is the name of the program you signed up for exactly? I can’t say for sure if it is a scam or not because I don’t know all the details, but I can tell you that being an Amazon affiliate is completely free and if that is all they are charging you for then you are definitely being taken advantage of. It also seems a little suspicious you’re being sold to over the phone. Do you know what exactly they’re offering you? Because if they aren’t telling you much and asking for $30 bucks a month, that isn’t right. You can be very proud of yourself for not paying for that program before doing some research about it. Please look at my comment on George’s comment for what I mean. You should never join a program that isn’t telling you the whole story before you pay. What are they hiding? To make money online you have to invest. You have to pay money to really succeed online. But you have to know where, why, who, when, what and how you are investing your hard earned money. Joining programs that are always free won’t really make you money, or it will be hugely time consuming. Somebody has to take money of their pockets so that you can earn. The best thing on always free programs that pay you are CPA programs, but even though you don’t have to “sell” anything CPA offers are somewhat not easy to get conversions. Many people won’t follow through even if the offer is “free”. But there are excellent programs that you can start free and afterwards have an upgrade option, others have an always free option (like WA), and if you really want to get in the high profitable train, get premium. In these programs you have the opportunity to test the program for free and see if it is something that you want to get involved with. Don’t worry about people asking you to pay them for something. Just analyze what you are getting for what you are paying. You pay for food, clothing, medical services, auto repair, rent, mortgage, recreation, travel, lodging, board, school supplies, college, internet access, electronics (you bought your pc, laptop, right? ), electricity, phone service, etc. Why not pay for your online success if it is going to produce your salary? Did you know that those online “gurus” that are earning thousands and even millions of dollars per month are paying (investing) hundreds and even thousands of dollars per month to get that earning? What you need to know is your “profits”. This is the difference between your investments and your earnings (income). If each time you spend (invest) money it will generate more and than what you spent, you are in the right track. Scammers know all about this, that’s why you have to be careful each step of your online success, because they will want to take money out of your pocket without delivering the service bought, or the very poor quality of the product or service delivered is more damaging than good. Nice write up and some good tips. I’ve been really trying to build up my Amazon sales with one of my niche websites(coffeemakersmadeinusa.net). Though the 24 cookie is challenging, I do see quite a bit of potential to really rake in some commissions with Amazon. Hi Wendy – very clear post. The thing that really put me off the program was the short window for punters to buy where you still get paid – what’s your view on this? Thanks for your guidance. I am working as a amazon associate but not any single sale . Can u help me how to promote i just create the facebook page that is https://www.facebook.com/Supermarketonline and promote it through social media like facebook, google plus, linkindi, twitter , pinrest but yet not succeed . So please guide me how to work it. I am only use those tools which are free. It appears that you don’t even have a website. Are you providing value to your customers or just linking them to the products directly from your Facebook page? This isn’t the proper way to market online and it doesn’t surprise me you aren’t getting sales. I suggest you try my recommended training course. Very nice article and you are true, the amazon program really works . I have added it on my website and I can see the earnings. It is worth it to have such an affiliation program where conversion rate is high though the percentage is less. I read your post and congratulations on your great effort Wendy. Im from South Australia and I have been learning blogging over 14 months.that Im enjoying really well and I’m almost a step closer to launch my website later. I have a question below! I joined amazon affiliate nearly 7 weeks and haven/t made money yet. Is there an easier way to make money the right steps with Amazon? Great article. Is the Amazon affiliate program stick for 90 days, 30 days ? I believe there’s a 90 day hold on your earnings, so there’s a 3 month delay from the time you start earning til they’ll pay you… but after that initial waiting period once you start earning regularly you should get checks each month! I’ve been an Amazon Affiliate for many years, and you are absolutely right – you can make money. You just have to still provide quality content for your readers, not just put links up. I have two different tools I use, on different sites – and you might want to look at them. First is Fresh Store Builder (www.freshstorebuilder.com) which allows you to build a really nice eCommerce type store. I add these to my blogs, and can use them for really focused stores that provide value. The second is a new WordPress plugin that just launched, called Fresh Bundle Master (www.freshbundlemaster.com) This is really neat in that you can add a grouping or “bundle” of products into a post, and make additional revenue without seeming spammy. I’ve already had some sales in just the last couple of days – it literally just launched this week. I highly recommend taking a look at it. Hey I’d suggest you sign up for my free email course. I will guide you on how to start out and give you some advice 🙂 You can find it within the right hand sidebar of my website.